A one-dish, slow-cooker tex mex quinoa casserole. This dish is bursting with fresh and healthy flavors with some good spice plus a great summer recipe. This dish is vegetarian, but chicken, ground beef, or ground turkey can easily be added in. I tend to kind of forget about my slow cooker as soon as it gets warm outside. Which is totally a shame, because slow cooker meals are my favorite. Do a little work in the morning and it’s like a magical dinner appears come dinner time. I’m kind of obsessed with that idea. And with slow cookers. Annnnd with this meal. Oh. And you know those slow cooker meals that take way too long to prepare before they are even in the slow cooker? Yeah…this is not one of those meals. Mostly just opening a few cans and throwing them in the pot. The only thing that needs to be chopped are the peppers and onion. Not too bad right? This meal is so easy. Also, this tex mex quinoa dish is super healthy. And vegetarian. Oh, but doesn’t have to be vegetarian if you don’t want it. Some chicken breasts or cooked ground beef/turkey can definitely be added in. If you want to do chicken, add in the raw boneless skinless chicken breasts at the beginning with everything else. With ground beef or turkey, you’ll want to cook that all the way through and throw it in with everything about 30 or so minutes before the meal is ready to be done. Also, slow cooker meals are pretty easy to adapt. You can trade out vegetables for ones you prefer more. And you could change the type of cheese you use. I used mozzarella which I loved, but a cheddar or Colby jack would be pretty great too. I used a can of Hunt’s tomatoes in this dish. The whole can goes in, you don’t even need to drain it! Hunt’s tomatoes uses a unique flashsteam peeling method which makes their tomatoes super fresh and tasty. Time to dust off that slow cooker, because they are totally great for summer meals and this quinoa tex mex! Rinse the quinoa well. I rinse my quinoa in a mesh strainer under hot water. 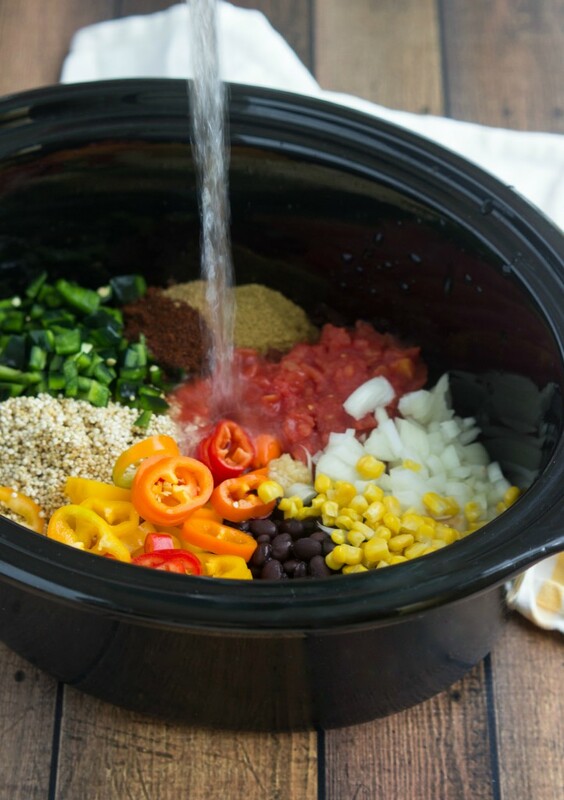 Place the washed quinoa, drained and rinsed black beans, undrained diced tomatoes, drained and rinsed corn in the slow cooker. Chop the sweet peppers and poblano chili pepper (remove seeds if desired). Add the chopped peppers, minced garlic, and chopped onion to the slow cooker. Stir everything together. Add in the chili powder, ground cumin, and chicken broth. Stir again and cook for 3-4 hours on high or until the broth is completely absorbed and the quinoa is cooked through. All slow cookers cook a little differently so make sure to occasionally check the dish to make sure the quinoa isn't burning or sticking all to the sides. Remove from heat and stir in the chopped cilantro, fresh lime juice, taco seasoning to taste, and green onions if desired. Season with salt and pepper. Stir in the mozzarella cheese and enjoy immediately. Have leftovers? I loved placing the mixture into a large tortilla (with extra cheese), rolling it up tight, and placing it in a skillet to brown the edges (1-2 minutes, switching sides every 30 seconds at medium heat). SO good! RECIPE UPDATE: I have had a few readers report a mushy consistency. It seems when readers are getting this result they are cooking it for too long and/or on low. I've never had a mushy consistency with this recipe which is why I specify in the instructions to cook it 3-4 hours on high (no options for cooking on low). For best results (as all slow cookers cook a little differently) check yours every hour and only cook on high for a maximum of 4 hours. If I want to add chicken should I brown it first? I am.assuming so since this recipe only cooks for 30 minutes in the crockpot. I have been using my crockpot so much in this hot weather. I think the recipe says on HIGH in the crock pot for 3-4 hours. Double check your recipe. Also she mentioned if using boneless skinless breast, just pop it in raw with other ingredients. If using ground turkey, brown separately and add during last 30 minutes of crock cook time. This looks delicious. I can not wait to try it! Thanks!!! This dish looks so great, Chelsea! I tend to forget about slow cookers during the summer too, but they’re definitely the easiest way to go. And I totally know what you mean about those recipes that call for you to cook a whole bunch of stuff BEFORE you put it in the crock pot. Kinda defeats the purpose, haha. This looks so great and easy, though! Love it! Wow. Sounds so simple. I’ve gotta give it a try. Hoping even my kids will love it! Have a wonderful Wednesday Chelsea! I forget all about the crock pot too once warm weather hits. I like to think of lighter, cooler dishes for summertime. And I have yet to do a one-pot crock pot style dish and this looks so delish. Pinned! 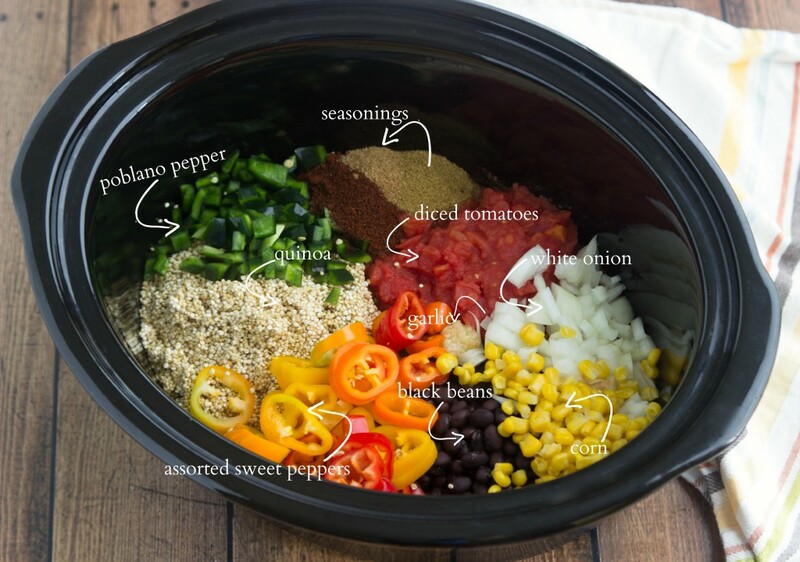 Nothing like throwing a bunch of delicious things into a slow cooker, to see it magically transform into something delicious without slaving over a stove 😀 Love the flavors in this, and your use of quinoa! A comfort meal, that’s healthy! Love the cilantro and lime juice! I bet a nice chunk of avocado would be perfect to garnish too! I can taste the flavors in my mouth. I love this tex-mex slow cooker recipe because its super easy and make a great dinner for the entire family! This looks amazing! I’ve never tried quinoa in the crockpot before! I don’t use my slow cooker much in the warmer months, either! That needs to change with this casserole! This looks amazing, Chelsea!! I can’t wait to try it! Pinned! And Happy Birthday to you! I hope you’re having a great day! I love quinoa with black beans! This looks really good! I just made a cold salad with similar ingredients the other day! I totally forget about my slow-cooker too when the days become warmer, it’s shame, because I still use my stove and oven all the time, and DIE of heat. This looks great Chelsea!! You know I just forget about my slow cooker in general, which is terrible since it’s so versatile! Like this quinoa casserole – this is amazing! Love the tex mex flavors for summer! Yay for crockpot meals! I love them for busy days – chop a few things in the morning and then dinner at night is so easy! This looks absolutely delicious – love me some tex mex! Ooh…so colorful and tasty-looking! I don’t actually own a slow cooker yet – any suggestions? A crock pot is perfect in the summer, especially since I try to keep my energy bills low by not running the ac too much. This still looks like the perfect light summertime meal. Pinned ! Slow cooker, Tex-Mex, Quinoa, Casserole — these words are like music to my ears! I love that they are all in one dish! I’m also loving the idea of adding chicken. It’s so hard to find good slow cooker recipes for the summertime, but this is just perfect. Pinned! I have been wanting to try this as soon as I saw it….tomorrow we are going to a BBQ, but I think Saturday is the day. Yum! This looks delicious, and I love how you can just dump everything in. That’s my kind of cooking! Pinned this one, because I’m working on adding more quinoa to my diet. This sounds perfect! Gorgeous pictures too! Hey Valerie! Thanks so much for taking the time to comment! 🙂 so glad you enjoyed it! Have a great week! Now this is what I’m talking about! I’ve decided to try to quit eating meat again (with the exception of seafood but no more chicken, beef or pork!) so this recipe is perfect. Plus, who doesn’t love using their slow cooker, especially during the summer! Thanks for the recipe, Chelsea! I love quinoa, but have only used it in salads. Can’t wait to try it in the slow cooker, especially with a Tex-Mex twist. And the added bonus is that this is such a healthy meal. The idea of starting it in the morning and coming home to a meal just waiting to be eaten will just add less stress to the day. Your presentation in the bowl is a great idea–makes everything clear and simple. Thanks for sharing. I made this last night. The flavors were great! I think I did something wrong though because the texture was really not what I was expecting. It came out kind of like a mush pile with the consistency of oatmeal. I didn’t wash the quinoa first. Also, I added two boneless skinless chicken breasts. Maybe that was the cause? Outside of the kind of gooey consistency it was awesome! I recommend that if you do add chicken to make sure to season it individually before sticking it in the pot. Thanks so much for the comment! I can’t figure out why your consistency was so off. I’ve made this with chicken and had the same consistency with or without it. I wonder if you maybe cooked it too long? How long did you cook it for? And great idea about pre-seasoning the chicken! I cooked it on low for 6 1/2 hours but then it sat on warm from probably another 3 hours probably. I went to bed and didn’t wake up when I planned on it :). Didn’t even think about that! Maybe next time I’ll try it on high and actually make sure I can take it off the heat when it is done. I’m actually eating it right now and it really is quite yummy! Thank you for the recipe! I look forward to making it again – and better! Ha! I made this again and cooked it for the RIGHT about of time. I did 3 hours on high. I also added the chicken breasts and seasoned them with a little salt, pepper, and homemade taco seasoning first. It came out EXCELLENT! I even got a compliment from my boyfriend, which is unheard of when it comes to food! YAY! SO glad to hear it worked out and you both liked it 🙂 Thanks so much Mikal! So just to clarify I guess you add the whole chicken breasts raw and did you leave them whole or cut into pieces? I cooked mine on low for 3.5 hours and it turned out very good. Though I have always thought my crockpot runs hot. When you mention to rinse the quinoa, is that after cooking it or just dry? When it is dry. I put mine in a fine mesh sieve and wash it really well. Rinsing the quinoa removes the saponin that had a very bitter and earthy taste. Made this last night and it was perfection!! Thanks for this great and easy recipe! Would this work without the cheese? It will work without cheese, but I think a lot of the flavor comes from the cheese, so it will definitely be more bland without it. Happy to have found this on Pinterest! I made it tonight and it is delicious. I too cooked it too long as I didn’t fully read the instructions while rushing to get out the door this morning. Happily, in it’s “mushier” state, it was great as a burrito filling topped with cheese and hot sauce. I’ve never felt compelled to leave a review for a recipe…until now! This is my new delish, healthy go-to. I make it weekly for myself, and even my meat-loving carnivore of a boyfriend can’t get enough of this meat-free tastiness. Thanks so much for this tasty recipe! This recipe looks great. But we don’t like quinoa. Is there something else I can use in its place? Thanks! Thanks Tammy! I haven’t tried the recipe with anything else, so I’m not sure what would work in its place. You could try brown rice, but I can’t say if that would or wouldn’t work! Sorry! Has anyone tried to make this a freezer meal? I was thinking you could maybe add the spices and canned items to a freezer bag and add the grain, water, and fresh peppers later, but would that really save that much time in the long run? Omg looks so good! I just bought some quinoa the other day so I’ll definitely try this soon! I noticed all of the food blogger comments. Is there a comment support group for food bloggers? If so would you please email me some info? I’m new to food blogging and would love the support of some fellow food bloggers! Hey Sharon! There isn’t a comment support group, but bloggers are super supportive! Just by commenting on lots of other blogs most people will generally return a comment on your blog 🙂 I just checked out your site & love it! My husband made this for last night’s dinner. It was fantastic! We didn’t have enough chilli powder so he used a tbsp of chipolte chili powder as a substitute. Added a bit of a wonderful bite to it! Put it in a little corn tortilla with a dollop of sour cream and avacado slices….to die for! So glad I found this recipe! LOVED this recipe 🙂 Quick, easy, and nutritious! We topped ours with fat free sour cream, salsa, and chopped avocado. My husband promptly grabbed the baby from me and offered to entertain her while I got him seconds 😉 great recipe! Thank you SO much Heather! I so appreciate your sweet comment haha and it made me laugh 🙂 Thanks again!! This was delicious! I was a little confused about the cook time – the recipe says 3-4 or 5-6 hours on high. I ended up cooking it for 5 hours on low. I added 3 chicken breasts, and I added 4 T taco seasoning, but left out the additional cumin and chili powder. I used Colby jack cheese. Hubby said it was awesome and got 3 helpings! All my kids loved it too- veggies and all! Thank you! SO glad to hear you enjoyed it! And sorry for the confusion on the cook time, I fixed the recipe 🙂 Thanks so much for leaving a review and so glad your kids liked it 🙂 Have a good one!! Hi Chelsea! I’m brand new to your blog, but I tried this recipe tonight, and I’m a huge fan! I’m excited to explore your blog more and try more of your recipes. Thanks!! Any idea on calories per serving? *The nutritional values are determined by the total ingredients divided by the number of servings for each recipe. Serving sizes may vary. The formula used here for points was obtained from public sources and is an empirical match to Weight Watchers calculators, but it is not an “official” Weight Watcher’s calculator. Do you have nutritional info for this recipe? Thank you!! I think there was too much liquid in this recipe. I just made it, and it has been cooking for 3.5h on high(the last 30m without the lid) and is still very liquidy. The quinoa was cooked around the 3h mark, but it was more like quinoa soup. Tastes good, but I’d cut the liquid by a drastic amount if I made this again. Thanks so much for your comment and feedback. So interesting you had lots of extra water; I’ve never had any whenever I’ve made this! I wonder if it’s a difference of slow cookers? Did it still taste good if you drained off all the water? It could be from a difference in quinoa also. I have noticed that the red quinoa that I normally use doesn’t need as much liquid added to it as does the white quinoa. Chelsea this looks super good!! This was delicious! Wow I was amazed at how easy this was to make and how good it came out. The flavor profile really works great and add a little cheese & green onion to the top AMAZING! Great recipe thank you!! I made this for dinner last night. When my husband walked in the door after work he said, “It smells amazing in here! When can we eat?” I love the flavor combination in this recipe, but like a few previous commenters, mine came out a bit mushy. That certainly didn’t stop us from eating it though! Super deliscious. I only cooked it for 3 hours, but maybe it’s my crockpot? Next time I’ll try decreasing the water a little as I can always add more if needed. Thanks for the recipe; we will definitely be making this again. And if it turns out a bit mushy again, we will just throw it in some tortillas for some amazing burritos! I made this for dinner tonight, and have a ton leftover. Can this be frozen?? I’ve never tried freezing it, but you could definitely give it a try. Sorry to not be of more help. If you do try it out, I’d love to hear the results! I just made this for dinner tonight – we’re vegan so I used veggie broth and will be leaving out the cheese. It’s delicious, though! I actually only cooked it for 2 hours on high in my Stay or Go, and it’s perfect consistency! This looks like a terrific meal to make on the weekend for the week ahead. I post a weekend healthy recipes roundup on my blog and had to link to your recipe. It looks like a real family pleaser. What size crockpot do you use? I have a 6 quart and the new Crockpot Casserole which is about 3 1/2 quarts (9×13 crock). I understand that the size of the crockpot can have a large effect on the results (overlooked, dry, etc). This recipe is currently in the crockpot! It’s been 3 1/2 hours on high and the chicken is still raw. I’m hoping 30 more minutes will do the trick. This recipe looks delicious!! Any feed back from others adding chicken? I hope this worked out for you Melanie! And perhaps other readers who have tried chicken can comment. I have found that first cutting the chicken into smaller pieces and then putting the chicken at the bottom of the crockpot works really well! I meant to make this tonight with the crockpot, but wasn’t able to time it right. Instead I sauteed the chopped veggies in a 6Qt stock pot, then added the seasonings. After letting the seasonings cook a few moments, I added the liquids and then the rinsed quinoa. I brought the mix to a boil and then cooked for 20 minutes. Last step was to add some more chili powder, the lime juice and cheese. Not as low stress as your recipe, but still do-able if you don’t have the three-four hours needed for the crock pot. Thanks so much for your comment Christi – this is so helpful for other readers! I appreciate it and I am glad it all worked out well 🙂 Thanks again! Thanks for the recipe! We made this for a potluck dinner party. There weren’t poblano peppers at the store, so we substituted with a can of green chili peppers. The flavor got a lot of compliments. The texture was definitely not at peak consistency due to transport time and keeping on low during social hour – it turned more into a hearty dip for nachos. Even my sister, who is an extremely picky eater and actively dislikes most of the ingredients, really enjoyed a bowl. Just made this! I used organic shredded cheddar cheese & sour cream instead of shredded mozzarella, and it came out AMAZINGLY! I am so obsessed! Can you tell me how I should reheat the leftovers? I know you suggested in a burrito, but if I just want to eat it as is, could I reheat it in a glass pan in the oven? Thanks so much! This was excellent. I did not have a poblano so instead used a few chipotles (in Adobo sauce) and it gave a nice smoky heat. Thanks for the recipe — great combination. Ooo love the idea to add in some chipotles! So glad to hear you enjoyed this dish; thanks for the comment! This sounds really good, I will try it in the Nu Wave oven with chicken drumsticks, because I can’t put anything in a slow cooker for 3-4 hours. I work an hour from home so it would be more like 10-12 hours in the slow cooker for me! Made this for dinner tonight. We loved it! 3 hours on high was perfect. Easy to make, and we loved the flavor. We’ve never had quinoa before, but after this recipe, we want to make it more! Thanks so much! Awesome!! 🙂 So, so great to hear!! Thanks for the comment Kelsey! And yes, isn’t quinoa awesome?! I just tried this for supper tonight. It was awesome! So easy and quick. We have been trying to eat healthier and have gotten tired of salads and chicken. So excited to try something different. Will be adding this to the meal rotation. This was great! Husband loved it too…couldn’t believe it was a vegetarian meal and that he would like quinoa. Thanks for sharing!! So glad to hear that! 🙂 Thank you so much Betsy! I was wondering if I could substitute couscous for quinoa? My family just enjoys it more but not sure about the cooking time in a crock pot. I’ve actually never had success with couscous in a crockpot 🙁 But you could make this on a stovetop and use couscous instead! Just made this and got a taste of it. It’s so delicious and flavorful. I added chicken, forgot I didn’t have cilantro, but otherwise followed exact, and everything came out perfectly. There’s tons and I can see tortilla chips scooping it in my future. Thanks for a great recipe that’ll lasts us days!